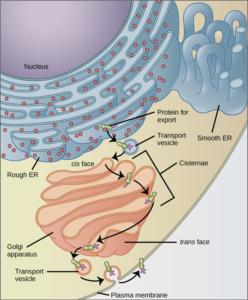 The endoplasmic reticulum (ER) (see Figure 13) is a series of interconnected membranous tubules that collectively modify proteins and synthesize lipids. However, these two functions are performed in separate areas of the endoplasmic reticulum: the rough endoplasmic reticulum and the smooth endoplasmic reticulum, respectively. The ribosomes synthesize proteins while attached to the ER, resulting in transfer of their newly synthesized proteins into the lumen of the RER where they undergo modifications such as folding or addition of sugars. The RER also makes phospholipids for cell membranes. If the phospholipids or modified proteins are not destined to stay in the RER, they will be packaged within vesicles and transported from the RER by budding from the membrane (Figure 13). Since the RER is engaged in modifying proteins that will be secreted from the cell, it is abundant in cells that secrete proteins, such as the liver. The smooth endoplasmic reticulum (SER) is continuous with the RER but has few or no ribosomes on its cytoplasmic surface (see Figures 6 and 7). The SER’s functions include synthesis of carbohydrates, lipids (including phospholipids), and steroid hormones; detoxification of medications and poisons; alcohol metabolism; and storage of calcium ions.